Tremendously entertaining, visually gorgeous and deeply touching, Inside Out might just be the best movie that I have watched so far this year. 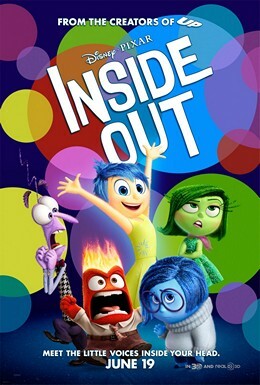 Released by Disney and Pixar, Inside Out tackles the mind of an 11-year-old girl where five personified emotions (Joy, Sadness, Anger, Fear and Disgust) deal with her daily activities and experiences. Now, she has to deal about moving in to a new place, a new school and a new neighborhood with the help (or burden?) of these five emotions. Kudos to the movie’s directors Pete Docter and Ronnie del Carmen for visualizing a unique story the way the moviegoers experienced it. Such a good story isn’t put to waste because of their careful directing. The voice actors are so alive in the film, especially Amy Poehler who voiced out Joy, of course. I remember her stint in Parks and Recreation wherein she played Leslie Knope, a very jovial character who’s the heart of that great comedy series. Her co-actors in the movie are also perfect for their roles: Phyllis Smith (who really looked like Sadness haha), Saturday Night Live’s Bill Hader (Fear), Lewis Black (troubling Anger) and Mindy Kaling (a shoo-in for the playfully sarcastic Disgust). The animation, the graphics and the visual effects are beyond amazing, while the musical score fills everything in that make the movie perfect. There are three things that I have pondered in this movie. One, you can’t just be solely happy in life. There are certain things that we can only learn from experiencing other emotions. Sadness is what we feel when we’re hurt or rejected. If you come to think about it, feeling sad is not that bad. Of course, nobody wants to be sad but there are times when inevitable things happen that makes us experience it. This feeling of being down is nasty, but we could somehow turn it into a way that can work for us. Sadness can make us realign our thoughts about things, including what made us sad in the first place. Also, it’s a way for us to know the people who really care about our feelings. It’s also a truth that sadness can force us to really move on. It’s been said for a lot of times that we should refuse anger if we can. In a way, that’s correct for we might not be thinking straight if we really are angry. But truthfully, we can use it as a gauge on what really upsets us that makes us move to change what it is. Fear is there to know our limits while disgust can be used to really know what we like and dislike. Two, the team up of Disney and Pixar is still the best out there for animated films. They might have hit a bit of a rocky road for the past few years, but they have proven with Inside Out that they’re definitely still the best in the field. Only they can consistently show those popping visuals that carry out a very inventive story about the emotional center of the human mind that touches every heart of those who watch. While watching, I think I’ve seen (in my peripheral vision) that a daddy (who was with his wife an kid) sort of sighed and sniffled during the very emotional scenes. Three, if the creators can find a way to make a sequel out of this movie, I’ll be more than willing to watch it in the silver screen! Every time I hear the tune of Mission: Impossible at the start of the movie, I can’t help but feel ecstatic because I know that I’ll be having a great time watching it. I remember the time when I watched Mission: Impossible 4 that I left out of the theater wanting for more. I was amped from the start until its middle part but the suspense kind of plateaued towards the end. But that didn’t happen here in Rogue Nation, a.k.a. Mission: Impossible 5. The craving I had before was definitely satisfied with this latest M:I movie. It’s definitely a great time watching the stunts of Tom Cruise along with his costars. Though looking back, it seemed like it was only him and his female partner in the movie, Rebecca Ferguson, who had really carried out explosive action scenes. Simon Pegg’s comic skills were put into good use all throughout the movie but Jeremy Renner and Vhing Rames were not as they only seemed to do what any other actor could do. I’m really not complaining, though, because Tom Cruise is the star of the movie and his action scenes were still a sight to behold. I’ve pondered about three things after watching this movie. 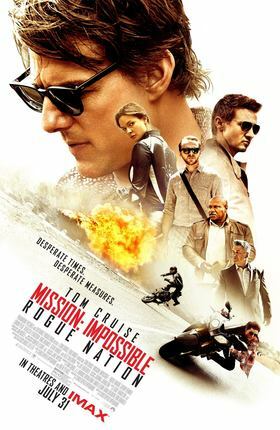 One, Tom Cruise at his 50 plus years of age, can still pull off awesome action that actors of his age can only dream of. I wonder until when can he do these kinds of things but until then, I’m eager to see him keep the race going even with competition from relatively younger action stars. Two, the Mission: Impossible franchise is far from over. As long as Tom Cruise is in it, millions of people including myself will be driven to watch it in the movie theaters. Three, an action movie that’s grounded with solid story-telling, moved by remarkably fast but effective pacing and highlighted by amazing death-defying scenes is a sure-fire winner. And that’s what Rogue Nation is.